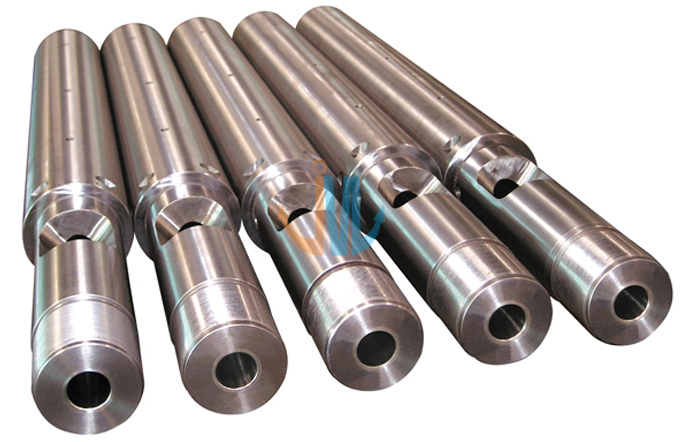 Our company has not only got the remarkable achievement on the production of normal bimetallic screw and barrel,also we have deeply researched on the barrel and screw for the special engineering plastic,for now much of engineering plastics add the calcium,kaolin,red clay, silica or add Glass fiber, carbon fiber, boron fiber and halogen free plastic to make the original plastic much better to adapt the specific plastic products.On the other hand, it may make the screw and barrel wear and corrosion quickly, In order to solve this problem,we have invented a kind of special alloy powder,whose ingredient contains 25%~50% Wc tungsten carbide.It makes the service life of screw and barrel much more longer than the other kinds of bimetallic screws and barrels. 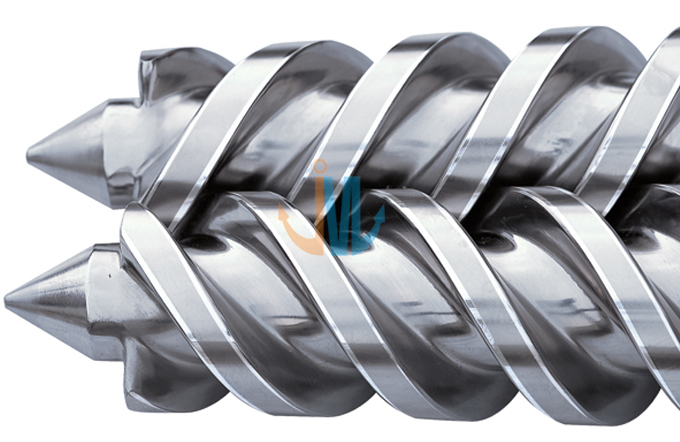 Grade-A superhard and high wearing resistance bimetallic screw: the base material is imported Sweden Km22 steel and superhard high speed steel, which is high wearing resistance, high toughness and high corrosion resistance, hardness could reach HRC59-64, allying for processing nylon plus 50% ~ 60% glass fiber, bakelite, magnetic powder, ceramic powder, magnesium powder, iron powder, copper powder, aluminum and other special plastic, the service life of 5-8 times longer than the nitrided one. 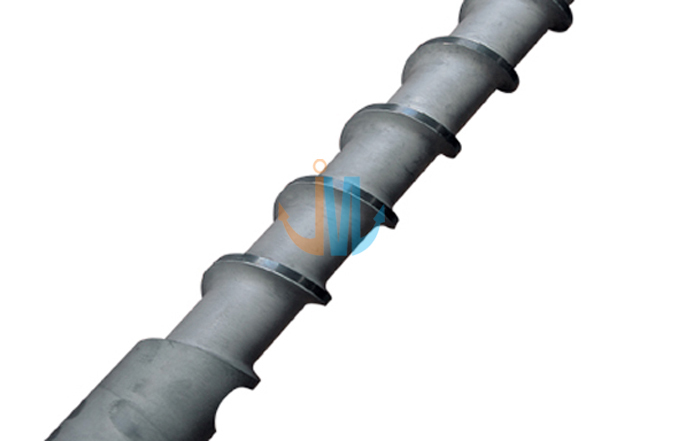 Grade B strong corrosion resistantance bimetallic screw:take base material of improted GRC-276, GE113 ,which is strong temperature resistance and high corrosion resistance, applying for the special plastic which is high speed,high temperature and high wearing and corrosion, nylon plus 20% - 40% fiber glass, halogen-free flame retardant plastic, PPE flame retardant plastic, XPS flame retardant plastic special plastics through solid solution plus aging hardening, the service life of 4-6 times longer than the nitrided one. Grade-C wearing resistance bimetallic screw: take base material of 38 CrMoAla, SKD61, din 1.8550 and1.8519 ,screw flight and bottom cladding alloy powder, the surface hardness can be reach HRC60 ~ 62, the thichkness of alloy layer is 1 mm - 2.5 mm, with extremely high wear resistance and corrosion resistance, applicable to PC, PE, PVC and other plastic processing. 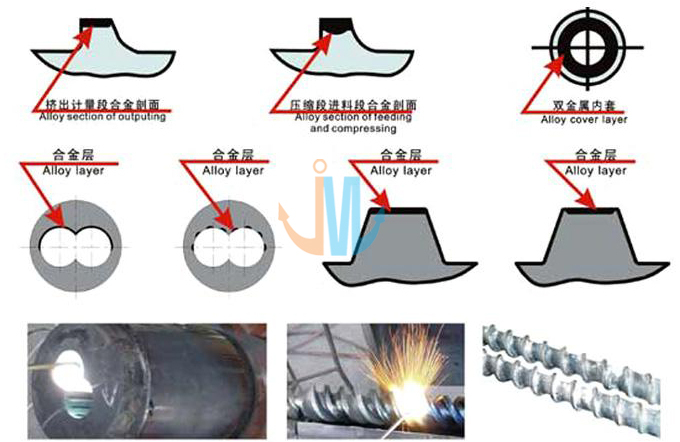 bimetallic screw for PC only:take base material of special stainless steel, 42 CrMo, then hardening and chroming ,suitable for processing transparent plastic products, such as lens, white material, back plate, guide plate, acrylic products, the service life is 3-5 times longer than the nitrided one . 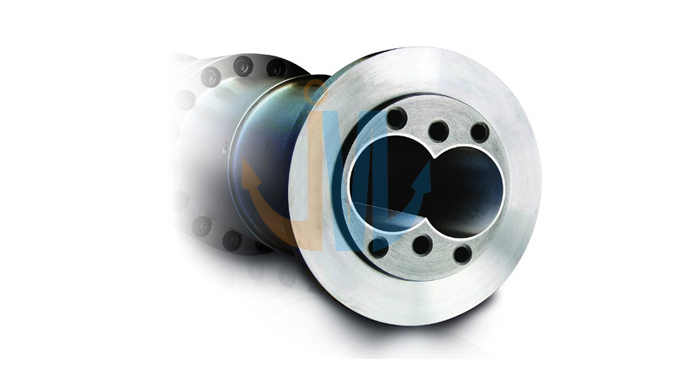 Screw take base material of 38 CrMoAla or SACM645, SKD61, din 1.8519 and 1.8550, material, screw surface spraying nickel base tungsten carbide alloy, alloy thickness 1.5mm ~ 1.5 mm, hardness reach HRC62-65, with the characteristics of high wearing resistance and corrosion resistance ,mainly apply for the PVC pipes, PE plastic foam, EPE pearl cotton board, XPS extruded plate, PE pipe, PPR pipe, cable machine, chemical fiber machine, wood and plastic, blown film machine, recycling granulator machine, the service life is 3-5 times longer than the nitrided one. 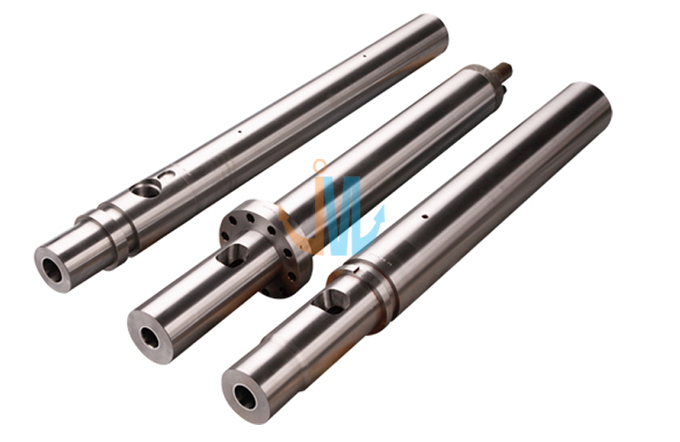 Screw can be selected from ordinary, gradual, pinned,shielding, separating and exhausting type, the compression radio of screw can be designed according to different raw materials and machinery. 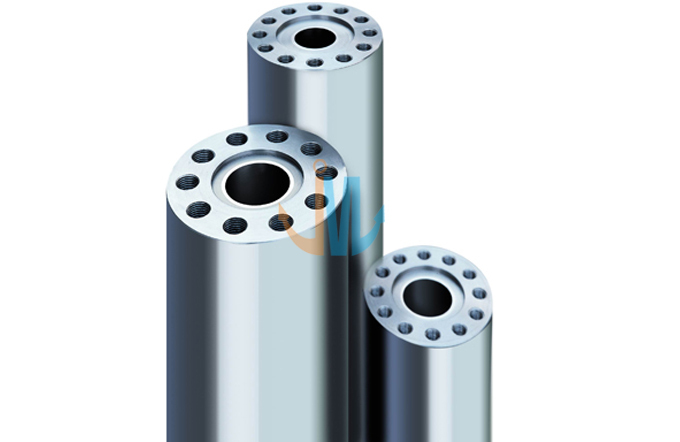 Bimetallic conical twin barrel has got the nation patent,and we are the only company in manufacturing the bimetallic conical twin barrel.Adopting the technique of rotary casting alloy,it makes the alloy powder’s compactness and wearing resistance the same as the bimetallic single barrel thus solving the defect of short service life and low wear-resisting of nitrided conical twin barrel,and rewrite the history of only manufacturing bimetallic single barrel but no bimetallic conical twin double barrel in domestic land. 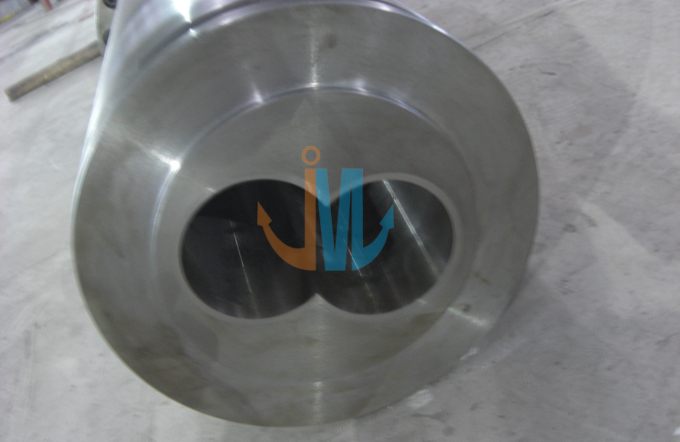 Wc-10 tungsten carbide alloy ,with the characteristics of high hardness ,high hard-wearing and corrosion resistance ,and high temperature resistance ,the hardness of alloy layer reaches HRC60-65,thus having the service life of 5-8times longer than the nitrided one.It is suitable for processing PVC plus calcium powder,building plastic template, pipe, sheet, ,WPC , hanging plate and other engineering plastics. Grade A screw: the base material is SKD61,Din 1.8519 or 1.8550,with the hardening then nitriding, the surface hardness of screw can reach HRC60-65,thus having the characteristics of high wearing and corrosion resistance . 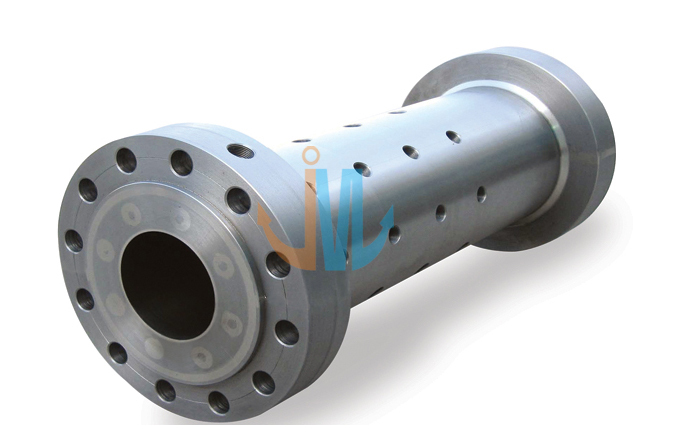 Grade B screw : the base material is 38CrMoAla,the screw flight through the high temperature spraying Ni-based alloy powder,the surface hardness can reach HRC58-62,thus having the characteristics of high wearing and corrosion resistance. 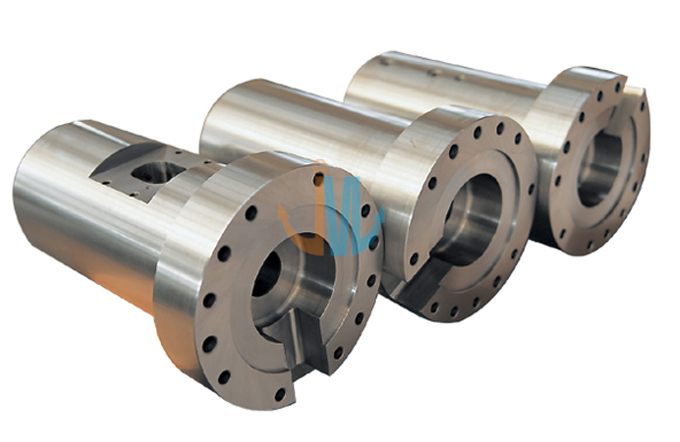 Bimetallic parallel twin barrel has got the nation patent,and we are the only company in manufacturing the bimetallic twin barrel.Adopting the technique of rotary casting alloy,it makes the alloy powder’s compactness and wearing resistance the same as the bimetallic single barrel thus solving the defect of short service life and low wear-resisting of nitrided twin barrel,and rewrite the history of only manufacturing bimetallic single barrel but no bimetallic twin double barrel in domestic land. 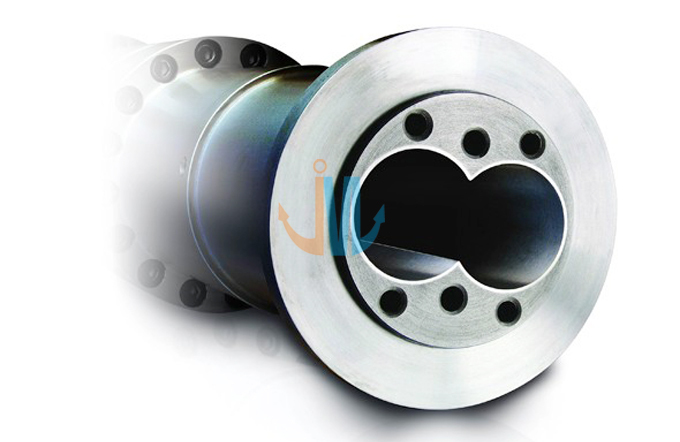 Wc-10 tungsten carbide alloy ,with the characteristics of high hardness ,high hard-wearing and corrosion resistance ,and high temperature resistance ,the hardness of alloy layer reaches HRC60-65,thus having the service life of 5-8 times longer than the nitrided one.It is suitable for processing PVC plus calcium powder,building plastic template, pipe, sheet, ,WPC , hanging plate and other engineering plastics. 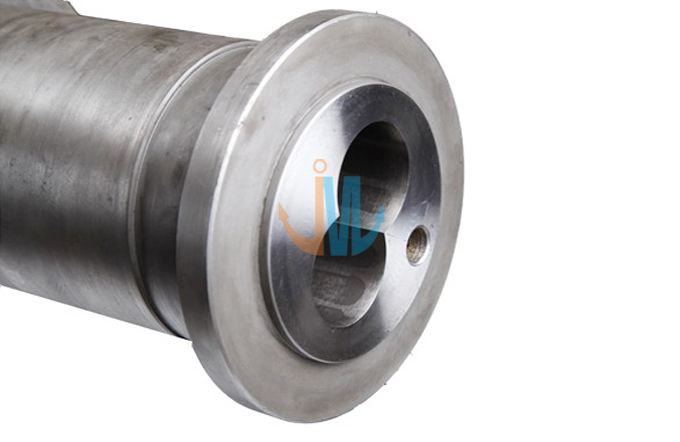 The bimetallic barrel for rubber machine is produced through high-temperature and speed centrifugal casting,the thickness of the alloy layer could reach 2mm-3mm one side,thus having the characteristics of high hardness , high wearing and high corrosion resistance . 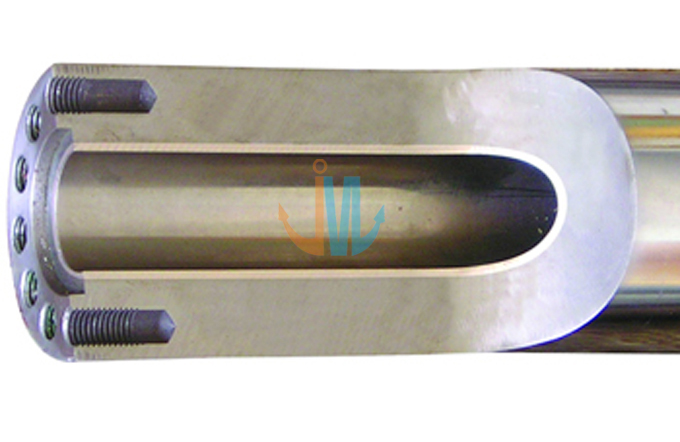 The screw flight spray the WC-10 tungsten carbide alloy powder,the thickness of alloy layer is 1.5mm-3.5mm, the hardness can reach HRC58-62.It is suitable for the rubber machine of the pinned cold feeding,ordinary cold feeding,exhaust cold feeding,new kind of hot feeding,rubber filtering,rubber injection ,magnetic strip.